The fight in LA to house homeless disabled veterans—on land donated to the government for them—has moved to the courts. Greg Valentini is a homeless vet in Los Angeles who took part in the initial invasion of Afghanistan and participated in the assault on Tora Bora that sought Osama bin Laden. He’s also a plaintiff in the class action suit brought by the ACLU of Southern California (ACLU-SC) arguing that the VA has “misused large portions of its West Los Angeles campus and failed to provide adequate housing and treatment for the people it was intended to serve.” (See my Nation article “LA’s Homeless Vets.”) Valentini was a private in the 101st Airborne, and the lawsuit describes his service in Afghanistan: “He took part in significant ground fighting, under nearly constant sniper fire and mortar bombardment” and “witnessed the gruesome deaths of numerous civilians, including children.” He was redeployed to Iraq, where he again experienced heavy combat. He received six decorations for his service. Steve Lopez, the legendary Los Angeles Times columnist, has been following Valentini. When he came back from Afghanistan, Lopez wrote, Valentini “ended up in post-combat hell, living in a tent by the Long Beach Airport, bathing in a lake and eating out of garbage cans.” He “doesn’t enjoy reviewing the harrowing details of his combat tours in Afghanistan and Iraq and his later descent into suicidal fantasies, homelessness and drug addiction.” He also told Lopez “I don’t want to be a whiny vet.” He “blames the bulk of his problems on himself, rather than the VA.” But he does think it would help other homeless vets who have severe emotional problems if they could live in the VA dorms on its Brentwood campus in West LA. The problem is that the land, donated 125 years ago for housing disabled veterans, today houses nobody. That’s why the ACLU-SC is suing the VA. (Disclosure: I’m on the board of the ACLU-SC Foundation.) Veterans of the Civil War, the Spanish-American War, WWI and WWII lived there for decades. But since the 1970s, the dormitories have been empty, and the VA has rented parts of the site to a Rent-a-Car company and a hotel laundry, along with a neighboring private school and UCLA, which use the land for athletic fields. Meanwhile homeless veterans sleep on the street outside the locked gates. 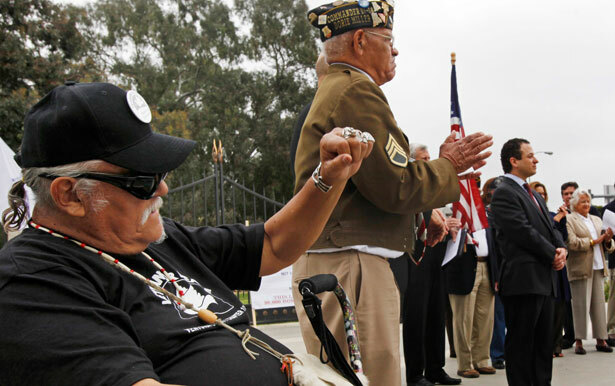 The LA story points to larger problems with the Obama administration and the VA. In Obama’s speech at the Democratic National Convention last September, he said, “When you take off the uniform, we will serve you as well as you’ve served us, because no one who fights for this country should have to fight for a job or a roof over their head or the care that they need when they come home.” He and his secretary for veterans affairs, Eric Shinseki, have declared they will end homelessness among veterans by 2015. Veterans are 50 percent more likely to become homeless than the average American, and homeless vets account for nearly 20 per cent of the people living on the streets and in shelters. At the rate the VA is working, there will still be tens of thousands of homeless vets in 2015. And LA is the capital of homeless vets in America. The ACLU lawsuit challenging the VA leasing practices is being adjudicated now, after US District Judge S. James Otero rejected VA motions to dismiss the case. Mark Rosenbaum, lead attorney for the ACLU-SC in the case, hailed that ruling last March as “the first time in the nation’s history that a federal court has held the VA responsible for assuring that severely mentally disabled veterans have access to housing and services…they require to heal the wounds of war.” Otero ruled that “Congress’ intention was to ensure that the [VA’s] land was used primarily to benefit veterans,” rather than a rent-a-car company or a hotel laundry. The VA replies to critics that it is spending $20 million to refurbish one building that will house sixty-five vets. Rosebrock says they could house thousands of vets for a fraction of that in a tent city at the site. He points to the tent cities that housed Vietnamese refugees on military bases around the United States after the fall of Saigon in 1975. In South California, he says, 1,000 tents and Quonset huts were erected at Camp Pendleton in six days by 900 Marines and civilians, providing housing for 50,000 Vietnamese refugees. If we could do it for Vietnamese refugees, Rosebrock says, we can do it for homeless veterans—many of whom, incidentally, served during the Vietnam War. Read Jon Wiener's primer on the VA-vet land war in the April 8 issue of The Nation.